Mystery of the ‘TCU lady’ – solved! Audrey Rogers, M.D., may not be one for social media, but that hasn’t stopped her from becoming an overnight Internet sensation. Dr. Rogers, a Cook Children’s pediatrician, was in the stands with her family on Saturday, watching TCU’s incredible triple overtime 47-41 victory against Oregon in the Alamo Bowl in San Antonio. During the dramatic second-half comeback, Dr. Rogers knew right away that her celebration while the Frogs were on offense drew the attention of ESPN’s national broadcast because her phone began blowing up with text messages. But then, she went viral. The website sbnation.com posted a GIF of Dr. Rogers celebrating and her daughter Dianna, 20 and a TCU sophomore, calming her mom down. After all, you don’t cheer while your team’s offense is on the field, right? 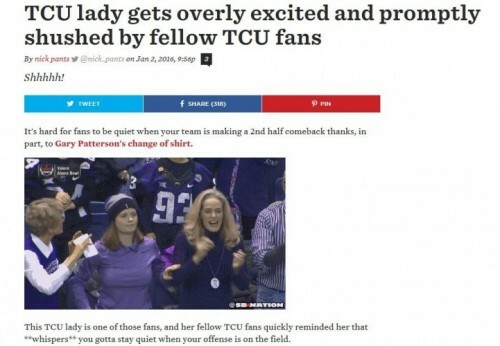 So how does this "TCU lady" feel about going viral? 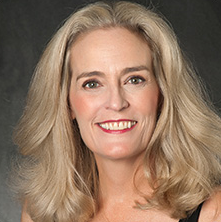 Dr. Audrey Rogers was born in Odessa, Texas and attended school at Highland Park High School in Dallas. Texas. She received her undergraduate degree from Emory University in Atlanta, Ga., her medical degree at Southwestern Medical School in Dallas, and completed her pediatrics training at Children's Hospital of Oklahoma. Her special interests are behavioral pediatrics and adolescent medicine. She became board certified in 1989. Dr. Rogers has been active in the Fort Worth community, serving as a board member for the Child Study Center and Hill School.